The gallbladder is an organ that stores digestive (bile) juices. It is positioned in the right upper side of the abdomen and below the liver. Gallbladder stones are also known as gallstones are formed of cholesterol. This may happen on consumption excessive fatty foods. Homeopathy is a medical procedure in which natural substances in minimal amounts are used to cure the ailments of a disease. Homeopathy for gallbladder stones can show great results in certain cases. If the gallstone is small or medium in size, homeopathic medicines can help it diminish and flush out with urine with time. It also removes symptoms such as strong abdominal pain. Surgical treatment may sometime need removal of the gallbladder which is not the case with homeopathic treatment. Moreover, this procedure doesn’t have side-effects and is cost effective. Calcarea carbonica :Gallbladder stones may sometimes result due to a family history that comes with genes. In such cases, calcarean carbonica is the medicine used for treatment. Moreover, this is also beneficial if the patient has signs of anxiety or is overweight with a high content of triglycerides and cholesterol. Chelidonium :This medicine is prescribed in case of the patient experience pain under the right shoulder blade and/or pain in the upper right abdomen. Lycopodium :If a patient has a family history of gallstones along with issues such as poor digestive health, gastric disorders, high levels of bad cholesterol, peptic ulcers, constipation or bloating. He or she may be prescribed lycopodium. Natrum sulphuricum :If a patient is suffering from disorders such as chronic diarrhea, abdominal pain, asthma, depression, obesity or joint pains this is the remedy medicine. Moreover, the patient becomes sensitive environmental changes. Nux vomica :In case a patient is dealing with nausea, colic pains, spasmodic pains, heartburn, gastric issues or bloating and is too fond of fried foods then this nux vomica is given to cure gallbladder stones. Therefore, homeopathy has medicine depending on the symptoms and habits of a patient. With homeopathy you can cure small and medium-sized gallbladder stones and avoid surgical treatments, However, homeopathic treatments may take some time to show results. So better to go for the laparoscopic Treatments to cure the problems from the root and to grab the fastest results. 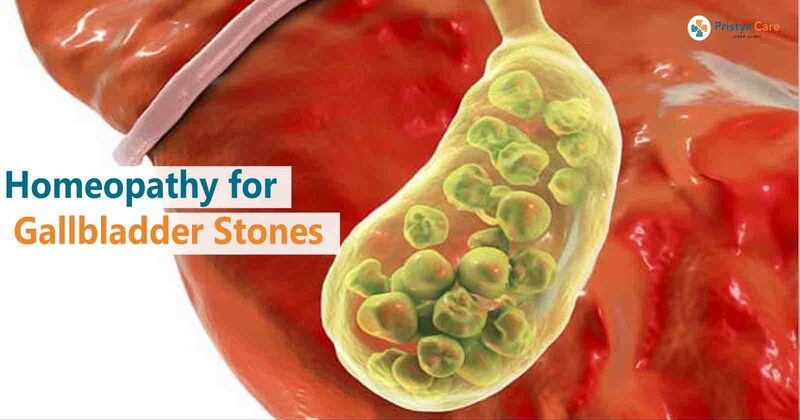 People having Gall Stones Problems may visit the Pristyn Care Laser Clinic to avail Laparoscopic Gallstones Treatment in Gurgaon, Delhi/NCR.